Annually, IVAA’s President and Board of Directors award three awards to people who made special efforts during the past year. Click to view winners. The awards are given at our Annual General Meeting held each April (everyone is welcome to attend). 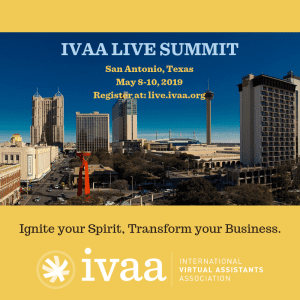 The award will be granted to a volunteer for IVAA that truly is a hands-on volunteer and is someone who gives back to the organization with their time. Three names to be chosen out of complete list of volunteers and Board of Directors decides within those names. * This award was created in Memory of Joey Wong, a VA from Hong Kong. Joey passed away unexpectedly in February 2011. Many of us remember Joey because she attended our 9th Annual Live Summit in Phoenix in 2010. We were impressed with her for traveling all the way from Hong Kong to come to Live Summit to network with her peers here at IVAA. This award is a way we can honor Joey and her energy, vibrancy and enthusiasm.